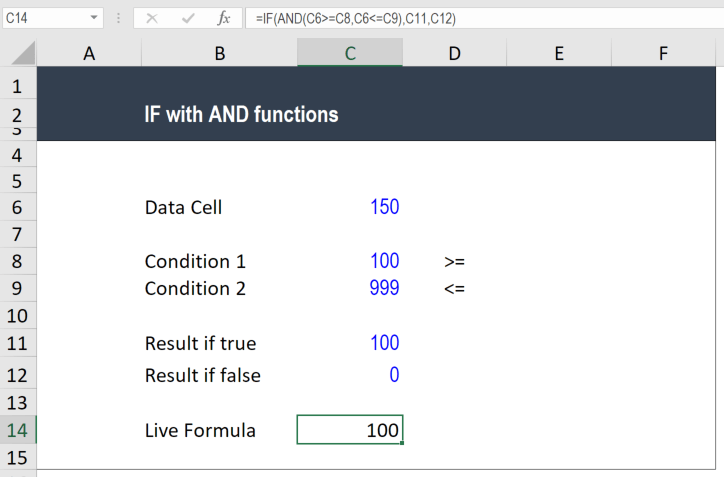 This article outlines how to use the IF with AND functions in Excel. In ExcelExcel for BeginnersThis Excel for beginners guide teaches you everything you need to know about Excel spreadsheets and formulas to perform financial analysis. Watch the Video and learn everything a beginner needs to know from what is Excel, to why do we use, and what are the most important keyboard shortcuts, functions, and formulas, you can combine IF with AND functions to return a value based on two different numbers. This can be very useful when performing financial modelingWhat is Financial ModelingFinancial modeling is performed in Excel to forecast a company's financial performance. Overview of what is financial modeling, how & why to build a model. A 3 statement model links income statement, balance sheet, and cash flow statement. More advanced types of financial models are built for valuation, plannnig, and and when you are creating conditional situations. In this article, learn how to build an IF statement between two numbers so you can easily answer the problem you’re trying to solve. For example, if you are looking for a formula that will go into to cell B2 and, if the number is between 100 and 999 then the result will be 100 – otherwise, if it is outside that range then the result will be zero. Download the Free Excel Template – IF with AND Functions. Step 1: Put the number in cell C6 you want to test (150). Step 2: Put the criteria in cells C8 and C9 (100 and 999). Step 3: Put the results if true or false in cells C11 and C12 (100 and 0). Here is a screenshot in Excel after using the formula for an IF statement between two numbers. You can clearly see how the result from the example is 100 because the number 150 is between 100 and 999. Congratulations, you have now combined IF with AND between two numbers in Excel! You don’t have to limit the resulting output from the model to only numbers. You can also use text, as shown in the example below. This time, instead of producing 100 or 0 as the result, Excel can display YES or NO to show if the argument is true or false. Important Excel formulasExcel Formulas Cheat SheetCFI's Excel formulas cheat sheet will give you all the most important formulas to perform financial analysis and modeling in Excel spreadsheets. If you want to become a master of Excel financial analysis and an expert on building financial models then you've come to the right place.